Hygena, a contestant on SciFi Channel's "Who Wants to be A Superhero?" brings her mission of cleanliness to the islands. It is a rare and, indeed, very special occasion when a real-life superhero steps onto the beach at Waikiki. On this picture-postcard Tuesday, the heroine known as Hygena confidently walks through the sand in turquoise blue cape and knee-high black boots -- yet none of the sunbathers or swimmers seems awestruck by her super- presence. "Who Wants to be a Superhero?" On TV: Airs Thursdays at 7p.m. on the SciFi channel. An agent in the secret cult of Hygieia, the ancient Greek goddess of healing and cleanliness, Hygena carries on the tradition of women before her, such as Miriam the Hebraea (also known as Mary the Prophetess), Hypatia of Alexandria, Hildegard of Bingen and Marie Curie. » A feather duster that shoots ionized radiation upward of 60 feet, immobilizing criminals and leaving them with a pleasant odor and a sparkling shine. » "Clean bombs" that cause her foes to fall unconscious for 30 minutes. » A magic beaded necklace, handed down by Hygieia herself. The beads, when thrown, create a crystallized soap-bubble force field around her. » Super-powered eyelashes that shield her eyes from dirt and dust and allow her to see through clouds and haze. No bother. There she stands in all her glory, her all-seeing eyes sparkling with glitter. The color of her costume matches the paradisical blue Hawaiian sky, set off by the black of her boots, fishnet stockings and beaded necklace, as well as her utility belt, feather duster and silver spray bottle. Yes, ready to rid the world of crime and grime! And ready to continue through the televised competition called "Who Wants to Be a Superhero?" -- the final two episodes of the season airing on the SciFi Channel next week. In yesterday's episode, Hygena made it into the final field of three. Huzzah! Between The Defuser, Hyper-Strike and herself, who will finally triumph? If you'll allow me to break out of my objective guise as a journalist, it is my fervent hope that Hygena will be the winner. She is a truly inspirational beacon of heart and hygiene. Who is the woman behind it all, you might ask? I can divulge that she is actually someone who has island life as part of her proud history. At age 15, Melody Mooney moved with her family from Canada to Hawaii, specifically the North Shore community of Laie. Her mother, Martha, said her brunette daughter tanned easily and picked up pidgin with a native's ease, so she had no problem fitting in. But her future would lie elsewhere. After graduating from Kahuku High School in 1987 and attending Brigham Young University at Laie for a while, she moved to Los Angeles to join her then-boyfriend. Melody Mooney on the set of the SciFi show with other 'Superhero' hopefuls. That relationship didn't last, but she stuck it out in La-La Land, and now Mooney finds herself living out a fantasy -- the ultimate geek fantasy. Not only is she an avid costume maker, a humongous "Star Wars" fan and the proud owner of a growing collection of action figures, she also has transformed herself into the personable superhero Hygena, a finalist in the SciFi Channel reality show "Who Wants to Be a Superhero?" The slightly loopy competition is judged under the watchful eye of the master comic book man himself, Stan Lee, co-creator of Spider-Man, the Fantastic Four, the X-Men and the Incredible Hulk. The show wraps up its second season Thursday on the SciFi network, and Mooney is back in Hawaii to share the experience of watching the show with her folks, as her fans wait for the results. Without divulging how Hygena/Mooney fares, Mooney did relate how it all started, as she sat in full costume Tuesday morning in the lobby of the Royal Hawaiian Hotel, drawing the occasional curious glance from passing tourists. During auditions at Universal Studios in Hollywood in April, Mooney was one of only five in her group to be interviewed by Stan the Man himself, quite an honor for any self-proclaimed geek. "I first thought that I would just go down there for the day, and it was great just to meet Stan Lee in person. But after that, I guess they liked me enough that I got a callback. I found out I was on the show right before the taping started. It was a big shock. I never thought I would actually make it, let alone be the last woman standing." 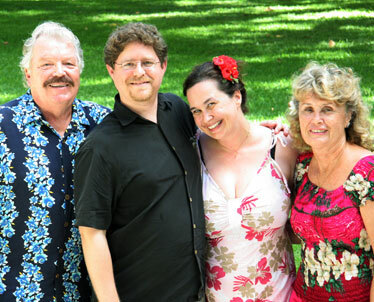 Melody Mooney out of costume, above, with her family, dad Keld Neumann, left, husband Mark Cronan and mother Martha Neumann, right. WHILE SOME fans of the show think of Hygena as a joke -- just another version of a tradition-bound woman -- Mooney considers herself a proponent of "third-wave feminism. Our generation, while appreciating what feminists previous to us have done, think that our gender has come full circle. It's not just about being a caretaker. We can do it all." Mooney has gotten much mileage out of her fanciful alter ego, based on the Amazon character Wonder Woman. She and comic-collecting husband Mark faithfully attend the San Diego Comic-Con as fans, but this year she and the other "Superhero" contestants went to the high-geek convention in all their costumed glory, courtesy Lee and the SciFi Channel. "I think Stan liked my superhero because she, like me, has a lot of heart. And compared to the other superheroes in the contest, like the Defuser, who's a policeman in real life and is a hero in the classic sense, my transformation into Hygena is like Stan's postmodern take on superheroes. The obvious example is Spider-Man, whose alter ego, Peter Parker, never expected to be a superhero until he was bitten by a radioactive spider." Melody Mooney as 'Superhero' Hygena. Keeping to the formula of reality show competitions, Mooney and her fellow contestants were isolated for the run of the production. In the Heroes Lair, Hygena, true to character, cleaned the bathroom, did the dishes and even helped clean the heroes' costumes. "We're all basically in superhero camp. We weren't allowed contact with the outside world except on our missions. I was able to get one phone call, to my husband, who is thrilled that I'm on the show. Other than that, we were totally disconnected -- no PDAs, TiVo, e-mails -- and that was weird." The superheroes were faced with different missions each week, and were eliminated one by one based on their performance. "It did get more emotional as the contest went on, and it was easy to bond quickly with the others," Mooney said. "I honestly liked everyone, but I did like in particular Parthenon (Dan Williams), who I did the 'Today Show' in New York with, and Ms. Limelight (Trisha Paytas), an 18-year-old from Hollywood, so much so that we still keep in contact." Hygena's toughest mission? "Definitely the Tunnel of Terror. Stan already knew what our biggest fears were beforehand, and mine's arachnophobia." With spiders being dropped on her in the dark, "I can't believe I did it. And I was sincere when I told Stan afterward that regardless of whether I win or lose, doing the show was still a rewarding experience because I felt I overcame my fear." Compared to the show's first season, which Mooney described as "funny and cheesy, with more individual missions," participation this year included some serious confrontations with the forces of wind and water, and group missions that required more cooperation. "The show, although campy, still addresses the serious question of what would happen if a real person aspired to be a superhero, and not just any superhero, but a Stan Lee superhero, one with character and heart. "And Hygena will live on in some way after all this. Still, it'd be cool if I could get a comic book." Sci-Fi's "Who Wants to Be a Superhero?"